In 1989, the French artist Georges Rousse came to Chile. Fate intervened to bring Rousse to the Open City, as in the case of other fortunate architects, poets, and dreamers. It seems that Rousse never quite forgot this trip to Ritoque: visitors to his solo exhibition at the MAC Parque Forestal are greeted by his rendering of the Hospedería de la Rosa de los Vientos o Celdas. 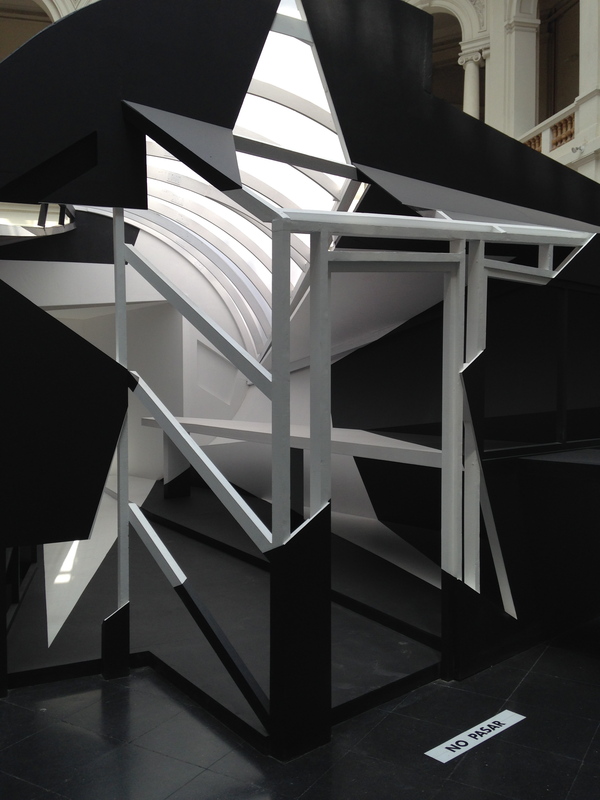 The installation contains a star which one can make out standing in a specific X-marked spot. Otherwise, the central design is an abstract ensemble of sharp angles. This piece is actually the only installation in a show composed of around thirty photographs. I could try to describe the brain chaos his compositions provoke, or you could just watch this interview. Two decades into the twenty-first century it’s difficult, but not impossible, to be amazed by artists. Indeed, as an art historian I’m always crossing my fingers to be bowled over. Rousse achieves this in spades and makes two-dimensional works sing. It wasn’t until halfway through the show that I realized his connection to the School of Valparaíso and I took a second look at the central installation. The lodge at the Open City is formally very similar to this piece. 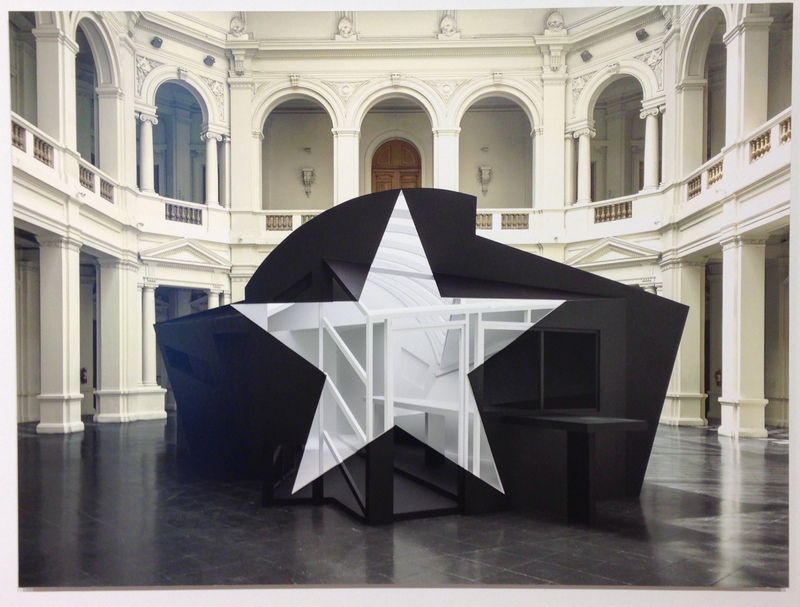 Rousse’s interventions are usually geometric in nature and stars are a frequent theme. However, with Santiago de Chile Rousse was particularly inspired by the School of Valparaíso’s commitment to poetry: his experience at the Open City was marked by an image of the stars set against a dark sky, shining over the Pacific. The single star also reminds me of the lone star in the Chilean flag, which existed before Texas was even a twinkle in Sam Houston’s eye. 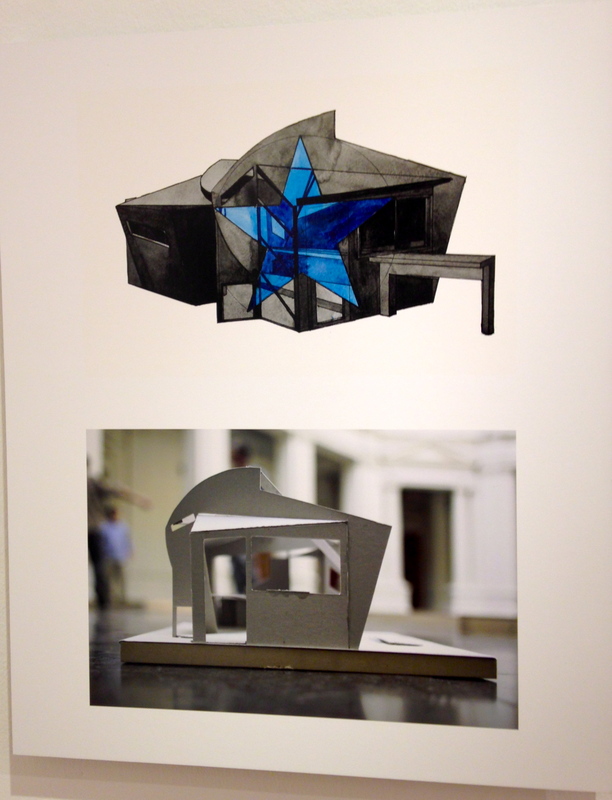 Rousse’s work is best experienced in person and I recommend getting to the MAC by January 19th.